Current Mod Finished! Thrunite TN31 Hi. 9/18 Update on post #41. Edit 9/12 Yesterday the 32mm mcpcb came in the mail! Couldn’t do anything all day until now. Putting hardwoods down… Not because I wanted to, no, but because we have a little puppy that hasn’t quite figured out the difference between outside and any square inch of carpet… Got the XP-L Hi flowed onto the mcpcb. Now it’s got me all excited, but stinks that I have to wait for another driver to show up in the mail. I ordered one from Acebeam for the K40L and another TN31 driver from Thrunite. Hopefully they will show up soon, but I think they are shipping the truly snail mail slow boat world tour from China. Anywho, here’s the pic of the flowed led. Enjoy! Edit 8/29 Alright then, looks like I’m modding my TN31 now. 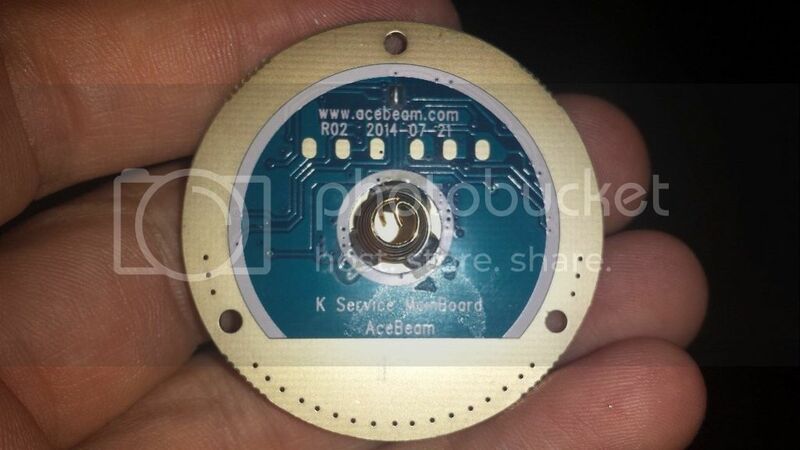 Definitely have the led and mcpcb on order. I’ll try to update the OP with my progress as I go along. I’m still new to the forum progress posting thing, so bear with me! Unable to leave well enough alone, I want to mod my thrunite tn31. I’m really thinking about putting an xp-l hi in it on a new mcpcb. Probably the resistor mod on the driver to bump up the amps. I like the idea of a factory dedomed led, because to be honest, I’ve messed up enough dedome projects to make me real nervous. What do y’all think? Is it worth it to mod that light, or should I look at building one from a more budget friendly host/flashlight? Oh yeah, it's worth it. The light is pretty tame stock. Put a solder blob or wire over the sense resistor bank and dedome turns the light into a serious light saber. There are a ton of contact points in that light. So cleaning them up to make sure they get good clean contact can make a difference too. There's a thread around here about modding that light. I’ll have to see if I can find that thread! I love the light, I just want to see how far I can take it! Probably gonna have to make saber noises each time I turn it on! Oh yeah, it’s worth it. The light is pretty tame stock. Put a solder blob or wire over the sense resistor bank and dedome turns the light into a serious light saber. There are a ton of contact points in that light. So cleaning them up to make sure they get good clean contact can make a difference too. There’s a thread around here about modding that light. ^Any tips on how to tell if you have the old or new driver? Found the mod thread I was thinking about. Solder blob sense resistor bank starts around post 150. Thanks for those links, it’ll save me a bunch of time searching! Gonna work on getting the thing apart tonight. I’m definitely thinking xp-l, just gotta find a 32mm mcpcb to put it on. Off to the interwebs! HA! Must have been an impostor. I would never forget something like that! I tried. Yeah, it sounded familiar when you mentioned it, but I was too lazy to search. Before you mentioned it, I did forget about that case. Thanks for alerting gaston to it. If he has the new one, you may have saved his driver. Best of luck gastontru3s1lv3r. It will feel like a very different light when you're finished. I'm curious how the beam pattern will turn out with that emitter. Please keep us posted. I may have to copy you. I’ll definitely keep my progress posted. Already got the mcpcb on order, about to pull the trigger on an xpl hi and some resistors. Probably gonna solder one on top instead of a blob of solder. Definitely gonna polish and beef up the battery carrier. Still trying to get the head apart, though. I’m having trouble getting that dang glue unstuck! That damn thread lock. As you probably know, it takes heat to melt it. I did mine by putting the head in a bag, placing the plastic bag in a boiling water for 5 minutes. When I pulled it out, my strap wretches could not grip (due to low quality). I had leather gloves on and cranked on that baby with all my strength. I had to put it down several times to cool my gloves. It took a while and just when I was about to give up, it started moving. Even after it started moving, it was a hard slog unscrewing for many turns. My take away was that boiling water brought it a temp that softened the thread lock, but didn't completely melt it. Maybe more time in the boiling water or a higher temp are needed. If I were to do it again, I would boil longer. If that didn't work, then I would use a heat gun cautiously to bring the heat up to 250F-300F. Obviously, take care not to burn yourself. Sure you know all the above, but said it just in case. My take away was that boiling water brought it a temp that softened the thread lock, but didn’t completely melt it. Maybe more time in the boiling water or a higher temp are needed. If I were to do it again, I would boil longer. If that didn’t work, then I would use a heat gun cautiously to bring the heat up to 250F-300F. Yea, definitely took some doing! I started off boiling it in a bag for a few minutes, then ended up using a small torch to heat just the area at the joint. It finally gave it up though after several minutes of cranking on it. Now that it’s open, time to start soldering and polishing. Just ordered the led and some resistors from digikey. Stinks that mtnelectroncs is sold out of the 32mm xp mcpcb’s. I really could use a US supplier right now!! Congrats. That was the hardest part for me. Too bad that monster base can't be used for the XP-L. That stock base is serious business. We need trade thread for when some one needs a part like you do now. There has to be some CONUS members that has one of those bases sitting idle. Guess you could do a WTB thread. Looks like identifying the new verses old driver is pretty easy. The below pics are from the threads linked to above. Notice the sense resistors are now on the top of the driver on the far right next to the large yellow tantalum capacitor. If you don’t mind an older model (meaning not the very latest version), Amazon has the TN31 for $69.95 Prime shippable in both cool white and neutral white. Yea, here’s the back of driver from mine. It looks similar to the older one. I’m assuming those two resistors to the right of the spring are the sense resistors. So far I’ve done a little work on the switch pcb. Beefing up the springs with some copper braid. I’m gonna get some progressively fine grit sandpaper and truly polish the ends of the battery carrier. I’ll keep posting as I go! Edit! I Guess I should also note that I ordered the 32mm mcpcb from int-outdoor. Hopefully it’ll show up in a few weeks. I think this light for $69.99 is a bargain for such a quality light. I have used a couple of the excellent xp32 noctigon mcpcbs with the extra thick traces and thought i would mention the – and + pads are on one [ when wired for single led] side meaning that both wires have to be directed through one shelf hole leaving one wire short which in my case i resoldered a longer neg wire to the driver. Looking forward to your updates tru3s1lv3r. Hmmm, you seem to have a TN30 driver there. That driver can do a lot more than the TN31 driver. For instance, it can drive a higher Vf emitters. The TN31 driver can only out put like 4.55V. The TN30 can drive 3 emitters in series. 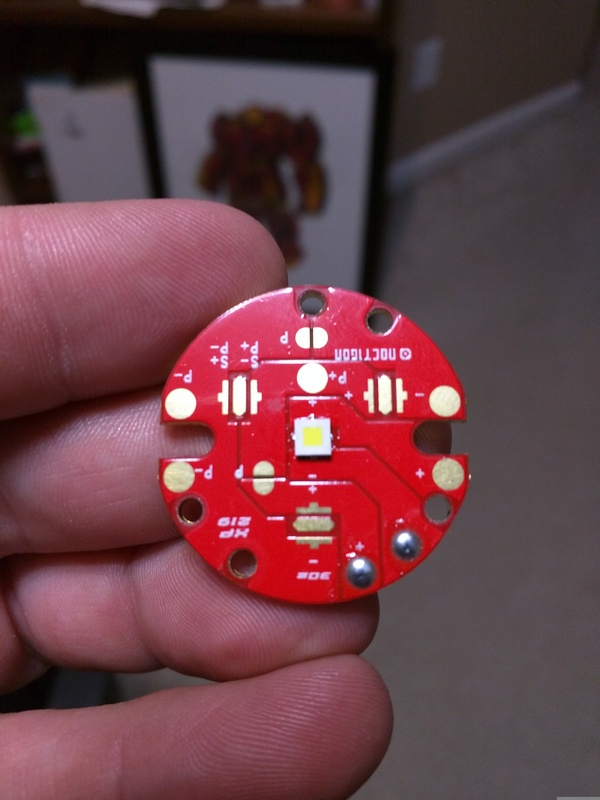 You could probably drop an XHP50 right on your stock MCPCB and have a heck of a light. Wouldn't be a pencil beam thrower, but it would be very nice light useful for many situations. I’m seriously thinking of buying another Tn31. Only $70 on amazon. May be another project later on to throw one of those xhp50s in it. I really like the light, it’s really well built! ^ That really is a good price. A normal TN31 couldn't drive an XHP50. Well, unless it has the same driver as you have. Your driver may be configured in a way that it can't drive a XHP50. You can try it and see though. I won't hurt your driver. It just won't be able to light up the emitter if it can't. Do you have a 6V emitter like the MT-G2 or something? 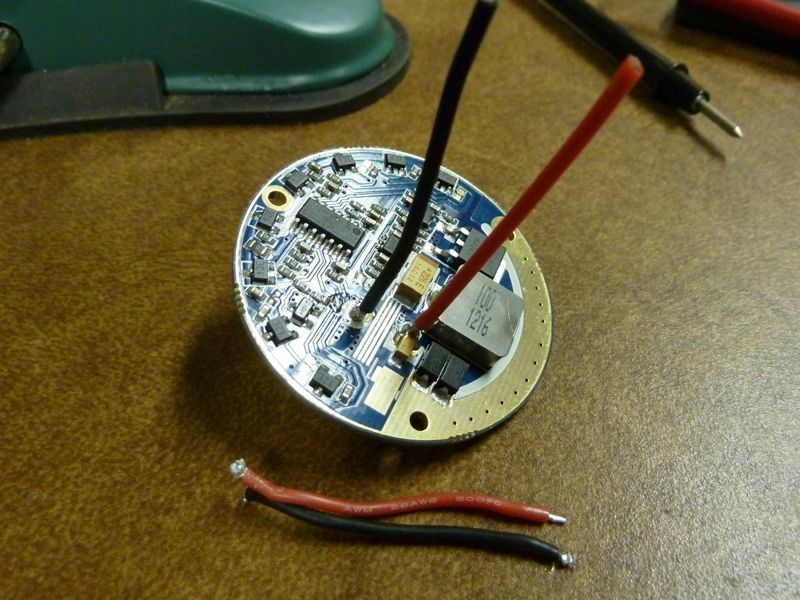 The way I tested my driver was I connected long leads to the driver and reassembled the lower part of the light. I then connected the leads to an MT-G2 in another flashlight head. I thought all the drivers have “TN30 Series” written on them, at least I know my TN31 does. I think its the same PCB but they use different components on them. I think others already tested the ability to drive a 6v emitter and it wouldn’t work. For what it’s worth, on the old driver like that one I wouldn’t bother with stacking resistors. Just remove them and bridge with solder. Virtually everyone who has modded those lights has done that without an issue. I did it a long time ago with my TN31 and have done probably 5 or 6 Supbeam/Acebeam K40s and besides the latest one which had the new configuration driver I am yet to blow an emitter doing this mod. 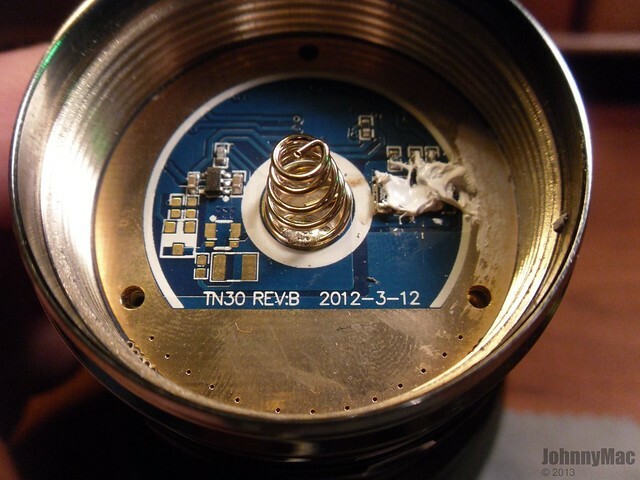 But if you are concerned about something happening stacking the resistors will be safer I suppose. I will be interested to know how you go with the XP-L emitter. 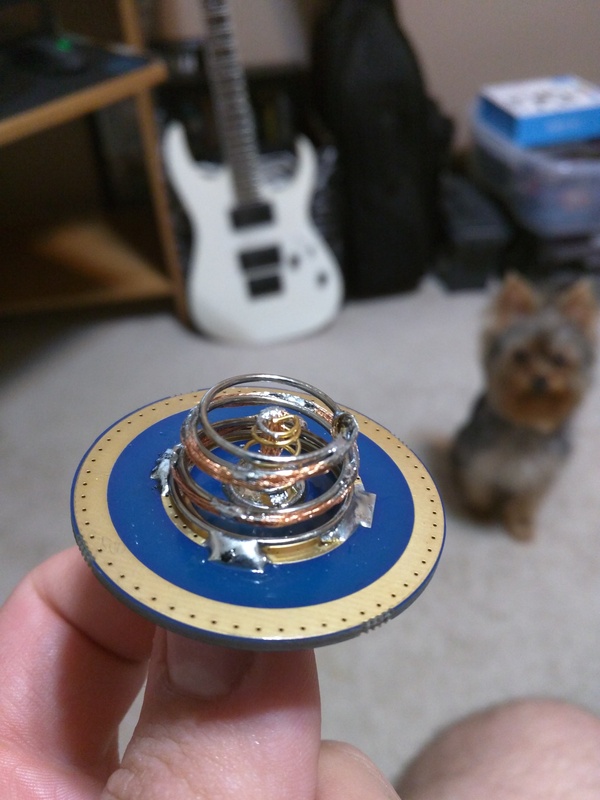 I am currently modding a TN32 for myself and was considering trying a different emitter perhaps even a de-domed XP-G2 S4 but I am yet to decide. The TN31 isn’t in production anymore and isn’t available from the usual sources so that is a really good price for a great light! I thought all the drivers have “TN30 Series” written on them, at least I know my TN31 does. . . . I think your right when it comes to the old TN31's. Being interested in this driver (the one used in the TN30's), I did some searching. It does appear that the old TN31 were labeled as you said. I just opened mine up and it too looks like yours. Searching also revealed that it appears the same board is used in both the old TN30 and old TN31, but they had different components on them. tru3s1lv3r driver looks different then ours or the ones I have seen in my searches.. The sense resistors are oriented 90 degrees in a different direction for one thing. I imagine his driver can't drive 6 volt emitters, but I wouldn't assume that without testing. That TN31 is tempting at that price. I think at that price I would still spend $43 more for a Fenix TK61. Much more driver mod friendly, holda 4 cells (can be extended to 8 or 12 cells), and much bigger (and shallower for wider spill) diameter reflector. The TN31 does have compactness in its favor though. You’re right, his does look a little different to ours. I seem to recall seeing that driver before. I will check my TN30s when I’m home. I’m sure one of them has that revision. I wonder if they actually changed the way the driver operates or if it was just a layout tweak?? 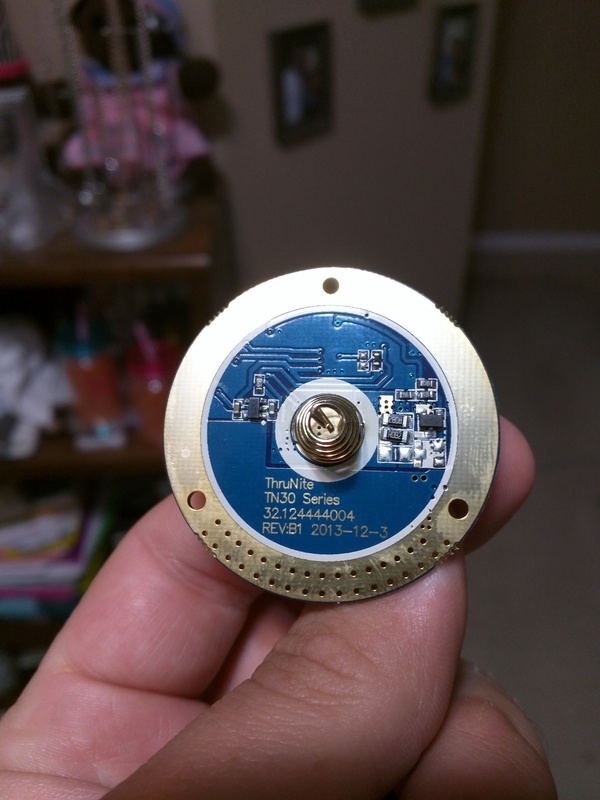 I’ve got an earlier xml2 version with the 2012 driver(components on both sides), is it safe to just jumper the sense resistor like on the XML versions? ^ Sounds like you have the same one as me. XM-L2, driver looks like LSX's above but I it has some more components on the other side of the spring (I think). Mine works fine jumped. I was glad I looked under the MCPCB though. Mine had a bump in the center of the shelf that restricted contact to the bump and the 2 MCPCB retaining screws. If I would not have fixed that, I would have had serious thermal sag and maybe rapid failure of the LED. So, apparently bypassing the resistors with some solder provides enough current to make the led work for about 1/10th of a second before making it a fancy paperweight. Just after which, before I figured out the led was shot, I was extremely worried that the driver had gone out! Gonna just go with stacking resistors so I’ll have some known resistance values to go by. I recently replaced the xml in my olight m22 with an xpl hi. I really couldnt believe the difference it made. It was pretty floody before now it reaches out pretty far. Definately my new favorate led. YeaYea, thatkind of what I’m gong for is the distance. II am curious to see how a thrower led will perform in a thrower host. I’m really hoping for over 250k lux. I’ll have to go buy a lux meter to find out numbers for sure once the project is done. Sorry to hear about the fried emitter. Kind of like a rite of passage. Welcome to modhood! Guess that means your driver can deliver the juice. I couldn't get my driver to deliver as much current as I wanted it to. Looking forward to what you come up with here. XP-L Hi in a TN-31 combined with your desire to push the limits sounds like the recipe for a potential beast. Well, I tried bypassing the resistors again, and… burned out another XM-L2… So, I believe at this point stacking resistors is the way to go! Gonna get my ammeter involved tomorrow and find out just how many amps the driver is pushing out to the emitter. Definitely going to determining the exact current and try to avoid burning out any more LED’s! I really don’t want to burn out my XP-L and have to reflow another one to that mcpcb! Does anyone know what the component is that sits beside those resistors? I’m wondering if it is a voltage regulator or a diode. The reason I ask is because mine let out the little gray magic smoke. Everyone knows that once you let out the magic smoke, you can’t put it back in! 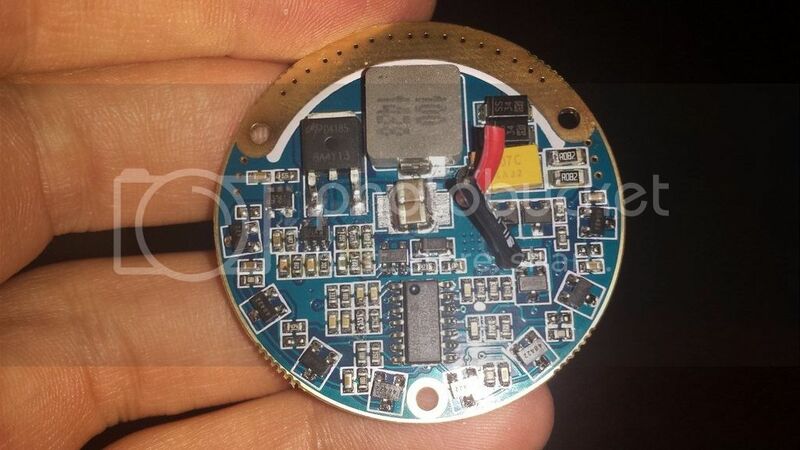 Can you read what is marked on the top of the chip? I can' t make anything out. Looks like a marker may have been taken to it. Maybe try to clean with some alcohol. It appears that the 3 pads below it are for a second identical chip, but can't tell for sure because the chip is covering a trace that I suspect connects to the top left pin pad.